Metro will launch the first in a series of three free summer art tours, Metro Art Moves_DTLA, on Thursday, July 4. The inaugural guided, artist-led tour will end at Grand Park and The Music Center’s 4th of July Block Party event, which will feature live music, food trucks and, for the first time downtown, fireworks. Metro Art worked with artist Sara Wookey to identify opportunities for local artists to amplify stories about artworks. The docent guides then share these stories with activities that heighten tour-goer engagement and demystify the Metro system. Meet promptly at 5:30 p.m. at the entrance to the 7th Street/Metro Center Station, at the northeast corner of Figueroa and 7th Street. Tour has limited capacity. Space is available on a first-come, first-served basis. Want to grab a snack before Metro Art Moves_DTLA, or feeling a little hungry afterward? Show your TAP card and take advantage of special Metro Destination Discounts at locations near the tour route including Qdoba Mexican Grill, Tossed and Boba 7. Save on your entire bill or enjoy free drink upgrades. Those who stick to ending their tour at Grand Park can use their TAP cards, provided on the tour, to score a free pair of sunglasses at the event information booth. Tours take place on the first Thursday of each month from 5:30 to 7:00 p.m., through September. 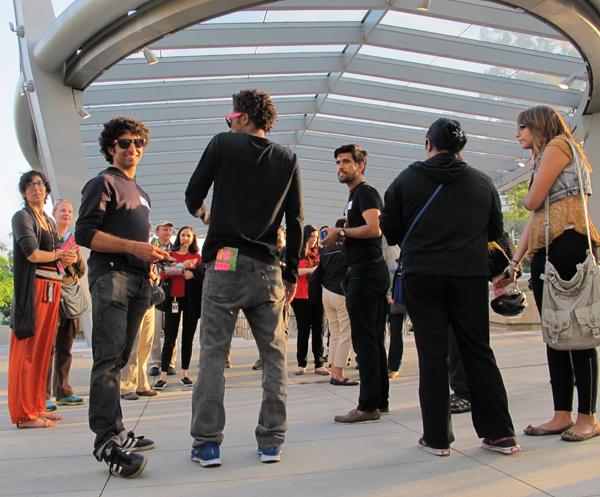 Tours begin at 7th Street/Metro Center Station and end at Civic Center/Grand Park Station. The tours are approximately 90% walking; there are elevators and escalators in all of the stations. Public restrooms are available at Union Station and at Grand Park. Metro Art Moves tours are designed to attract new riders through arts-based transit experiences. The tours highlight Metro’s diverse collection of artworks, heighten the passenger experience in fun and engaging ways to boost public perceptions about transit, promote rider etiquette and offer opportunities for discovery. Metro Art implements the agency’s percent for art program, manages the care and maintenance of the system’s existing artworks and directs a volunteer docent council. From rail and bus stations to construction fences and poetry cards, art creates a sense of place and engages transit riders. Since 1989, Metro has commissioned artists to incorporate artworks into a wide array of transportation projects throughout Los Angeles County. The agency has received numerous design and artistic excellence awards, and is renowned for its approaches to integrating art into the transit experience, and for engaging artists at all levels of their careers. Docent-guided tours are offered the first Saturday and Sunday of every month. Tours for groups of fifteen or more are also available by special arrangement. For more information visit metro.net/art and click on Art Tours or call (213) 922-4ART.